Which album printing companies does your design service work for? We can create album designs for ANY album printing company of your choice. We also offer our own in-house line of physical albums called Align Legacy Books for those photographers looking for an all-in-one service. After the design is approved, you will have the choice of receiving your finalized layouts as flattened .jpgs or layered .psds. You can also request Photojunction .pjx files or InDesign .idml files if you prefer. After downloading the files, you can then send them on to the album company of your choice. If you're ordering an Align Legacy Book, we'll direct you to a new order form to place your print order. Do I need to know the exact product type I'll be ordering from my album company? If you're ordering from one of the following album companies, please specify the exact product type on your order form as it may change the dimensions we use to set up the design. If your company is not on this list, specifying a product type is still very helpful to us, but not required. American Color Imaging - Are you ordering a Riveli Album, Econo Layflat Album, Hinged Memory Book, or Non-Hinged Memory Book? Artifact Uprising - Are you ordering a Lay Flat Album, Hard Cover Photobook, or Soft Cover Photobook? Artsy Couture - Are you ordering an Album, a Canvas Photobook with Lay-Flat Paper, or a Canvas Photobook with Regular paper? Cypress - Are you ordering an Iris Book, Juniper Book, Whistler Book, Magnolia Book, Gutenberg Book, or Cypress Album? Forbeyon - Are you ordering a Flushmount, Linear, Hinged, or Perfect album? GTA Imaging - Are you ordering a Renzo, Alba, or Avenue album? IRIS Book - Are you ordering a Flush Mount Album, Press Book with Semi Lay Flat Binding, or Press Book with Standard Binding? Leather Craftsmen - Are you ordering a Split or Folded edition album? Miller's Lab - Are you ordering a Millers Signature Album, LayFlat Album, Miller’s Signature Book, LayFlat Press Book, Hard Cover Book, or Soft Cover Book? MPix Pro - Are you ordering an Assembled Album, Hard Cover Album, Soft Cover Album, Signature Album, or Layflat Book? ProDPI - Are you ordering an Press Album, a Photo Album, a Layflat Press Book, or a Magazine Style Press Book? Renaissance - Are you ordering a SoHo, Essex, Roma, Fine Art, Galleria, Library, Milano, Ambiance, Ventura, Park, Elan, or Bowery album? WHCC - Are you choosing an Album or a Press-Printed Book? If it's an album, which paper type are you choosing? If it's a press-printed book, is it lay-flat hinged or magazine style? OTHER - For all other companies, specifying a product type is still very helpful to us, but not required. Remember, Align can design for almost ANY album company of your choice. Do you design for other types of events and sessions like family portraits, boudoir, seniors, etc.? Absolutely! Anything that you need an album design for -- send it our way! Instead of writing the bride & groom's names on your order form, use that spot to give your design a different name (Smith Family, Mary's Boudoir, etc). I'm not a professional photographer. Will you still create my album? Typically our clients are professional photographers, so our process and pricing would be a little different for you than it would be for a photographer. Whenever possible, we recommend that you contact your photographer directly to get an album made. But if for some reason this is not a feasible solution for you, we would be happy to work with you as long as you have the rights to your high-resolution images. We would work with you during the album design process and then print and ship your album. Please contact us at info@alignalbumdesign.com to tell us you're not a professional photographer but would like to discuss the process and the pricing for direct consumers. Is there a minimum or maximum album size Align will design? Our minimum album design size is 10 spreads (20 pages). There is no design maximum other than the limitations provided by the album company of your choice. For printed Align Legacy Books, the maximum design size is 40 spreads (80 pages). What's the difference between a SPREAD and a PAGE? A spread is the size of the full layout while the album is open. For example, a 10x10" album would have 20x10" spreads. A spread is made up of two pages. Our album designs are $8/spread or $4/page. Therefore, a 15 spread (30 page) album design would cost $120. Can I request a specific designer? Yes, absolutely! We keep your design preferences on file so that your needs are met no matter which designer you are working with, but if you happen to fall in love with one of us (which has been known to happen!) we will pair you up with your preferred designer whenever their availability permits. To make a request, either write your preferred designer's name in the "Additional Notes" section of your order form or email info@alignalbumdesign.com to let our General Manager know that you'd like to always be paired with that designer! How long can I expect to wait for the first draft? What are your turnaround times for designs? We'll send you a link to your initial design in 4 business days or less! In a hurry? For an additional $50, we can usually offer a 24 hour rush delivery for initial designs (availability not guaranteed, please contact us). How many rounds of revisions do I get? For each album design order, you get up to 3 rounds of revisions included in the price. And whenever you send in your revisions, they will be done in 2 business days or less. We recommend using the first round to make your own changes to the album and then using the 2nd and 3rd rounds for your client. If you need more than 3 rounds of revisions, we charge $50 per additional round. What if my client is taking forever to make their revisions? Do you have a policy for how long you keep the design open? If your album design order has not been finalized after three months, you will have the option to pay the remaining balance to keep your order open or it will be purged from the system at that time. However, once the balance has been paid, we can keep your album design on file for up to one year from the date you placed the order. If the design has still not been finalized at the one year mark, you will have the option of receiving the as-is files or paying a $50 extension fee to keep the order open in our system. How will you be delivering my final layouts? Our typical workflow is to send you the final high-res files through Hightail. You'll receive an email with a download link within one business day of the design being approved and the balance being paid. You’ll download the files to your computer, review them closely, and then upload them to your album company's website. If your album company is Leather Craftsmen, Madera, HiTech, Folio, or Sander -- You may request to use AlbumExposure's Send-to-Print option. Instead of downloading the files to your own computer, you can send the layouts to your album company directly through the same website we use for proofing. The files we use during proofing are low-res versions that have image numbers in the corners, so you'll still need to wait for your designer to upload the print-ready versions to AlbumExposure after the design is approved. Once this step is complete, your designer will send you an email letting you know that the files are ready and you can login to your AE account and use Send-to-Print to finalize your order. Do I need to select the exact images for the album or will you select the images as you design? When ordering your album design, you have the option of specifying whether you would like your designer to use all of the images you send, or whether you want them to select the images that best tell the story from among those you send. For best results, we recommend specifying an approximate range of spreads (i.e. 15-20) on your order form, and allowing your designer to pick the images that work best together to create a cohesive design. Feel free to send a "favorites" or "must use" folder, as this will help your designer create a design that you are guaranteed to love in the first draft. How should I prep my images? Please send no more than 300 images in chronological order. Please make sure your image file names only contain letters, numbers, hyphens or underscores. Please organize your image collection so that your designer can view the images in a single start-to-finish sequence of day's events. We prefer to sort by filename, but if sorting by "date created" is necessary, please communicate that with us. When batch renaming your images, make sure to use a numbering convention with a consistent number of figures (i.e. 001, 002, 003....200). Please also remember that your client will likely reference image numbers for changes they'd like, so it's best to keep the image names consistent with those your client sees. If you need to rename the images to put them in order for us, you're welcome to put the sequence number at the beginning so that the existing image numbers stay intact. Make sure never to send two different images with the same file name. This includes images that your client may request during revision rounds and that you may send to your designer at that juncture. We cannot work with multiple images of the same filename, so try to think through this issue ahead of time and make sure all of the images from the entire event have unique filenames. We recommend sending your images in two folders -- favorites & additional images. If you send a favorite images folder, those images will be used as focal points for the design, so you will be more likely to love it. In order to speed up your upload time, save your images as quality 10 .jpgs (Photoshop) or quality 92 .jpgs (Lightroom). This will not impact the quality of your images, but will cut down on image size. Zip all your folders/images into ONE FILE before uploading. (See next FAQ question if you are unsure of how to zip files.) Name the file using this convention: "your studio_client's first names". How do I zip my images into one file? In the menu that pops up, choose "Compress..."
Rename the zip file using this convention: "your studio_client's first names"
How many images should I send? We can of course customize for you and include more images per spread on average, but this is our ideal recommendation for a stunning design. On your order form, you will be able to designate whether you want your designer to use all the images you are sending in the design, or whether you'd like to give them freedom to select the images that best tell the story from those that are sent (in which case, not all of the images sent will necessarily be used in the design). For best outcome, we recommend selecting the 2nd option and sending more images than will be included in your final design. How should I send my images to you? Make sure to first prep your images by following the instructions listed earlier. 1 - If you already host your images using PASS, Pixieset or Zenfolio, go to the next FAQ for instructions. 2 - You can upload your images to us by clicking here: https://spaces.hightail.com/uplink/alignalbum to use our Hightail uplink. Please include your studio name and the first names of the bride & groom in the subject line. 3 - If you have Hightail, Dropbox, or WeTransfer you can send your images to us at info@alignalbumdesign.com. Please include your studio name and the first names of the bride & groom in the message. Once we receive your images, a designer will contact you via email. How should I send images to you if I use PASS, Pixieset or Zenfolio? In your PASS settings, set your upload size to "originals (slower, not recommended)" rather than "high resolution". The "high res" setting WILL decrease the resolution of your images. PASS still considers them "high res," but they are not high res as in "the size they came out of your camera". When printing your album, you will want the largest images available to be used, so you need to make sure to select "originals" on the upload. PASS will ask you to confirm this for every upload and warn you that it will take longer, but it's really not THAT much longer. To give us access, make Align a V.I.P. using the email address info@alignalbumdesign.com and password "albumdesign". Check "use original filenames" under "advanced geeky stuff" on the event tab. Include the URL to access the gallery, as well as the folder name(s) that you'd like us to download (remember -- max of 300 images) either in the comments section of the order form or in an email to info@alignalbumdesign.com. Use the image quality instructions listed above, but then here's a video for how you email us an invitation to download specific images from PASS Plus. Unless you use that method, our only option will be to download the FULL collection (PASS Plus doesn't allow selective downloading of folders). To enable downloads, go to Settings>Download and make sure the “Collection Download” switch is turned ON and under “Download Size Allowed” you’ve marked “Original”. To give us access, click the “Share” button and either use the “Email Invite” tab to send an invitation to info@alignalbumdesign.com or go to the “Collection Info Tab” to copy & paste the collection URL, Photo Download PIN, and the folder name(s) that you'd like us to download (remember -- max of 300 images) either into the additional notes section of the order form or in an email to info@alignalbumdesign.com. To enable downloads, open the Access Control Panel (on the right) for the gallery you want to share. Click on the “Photo Originals” text to bring up the Access Control pop up screen. Make sure that “Allow Downloading” is selected. if it is grayed out, uncheck the “Same as Containing Group” box at the top to enable editing the settings. To give us access, copy & paste the gallery URL as well as the folder name(s) that you'd like us to download (remember -- max of 300 images) into the additional notes section of your order form or in an email to info@alignalbumdesign.com. If you’ve locked the gallery, please be sure to provide us with the password in addition to the link. Once we have successfully downloaded your images, a designer will contact you via email. How does your proofing work? If you already have an account with Album Exposure, Align will work seamlessly with your existing account. If you do not have an AE account, you will be able to set up a FREE account when working with us, in which you can have up to three open designs (designs that have been sent on to clients and are not yet approved) at all times. When you are sent a link to an initial design by one of our designers, you will either sign in to your existing AE account, or quickly set-up your free account, and then proceed as follows (Note: the following instructions describe our standard workflow. If you purchased our Hands-Off service, the process will be different, as explained here). Option 1: If you would like to make changes to the initial design yourself, you can submit them by typing next to each spread. If at any time you need to step away from the proof and aren't quite ready to send your comments, you can close out of the browser and they will be saved for later. When you are ready to submit ALL of your comments, click the “REVISE” button on the proof, and your designer will be notified and make the changes that you've requested. Option 2: If you would like to give final approval yourself (if you do not need to send the proof on to your client), click the “ACCEPT” button on the proof. On the next screen click “Approve Album.” Once you do this, you will shortly receive an invoice for any balance due on your order, followed by the final layouts upon payment of that invoice. Option 3: If you would like to send the proof on to your client for revision or approval, click the “ACCEPT” button on the proof. On the next screen click “Send to Client.” Follow the instructions to set up your preferences and send the link on to your client. Note that your comments and conversation with your designer will not appear on the new proof, and your logo will replace Align's at this point. We recommend choosing the communication setting that automatically shares your client’s comments with Align unless you’d prefer to copy & paste your client’s comments to us during each revision round. Click here to learn about AlbumExposure's communication settings. We will not communicate directly with your client unless you explicitly instruct us to do so. If your designer needs additional images from you in order to complete your client's requests, she will email you directly. Once your client is happy with the design, and they hit the "approve" button, we will be notified. You will then receive an invoice for any balance due on your order, followed by the final layouts upon payment of that invoice. Want to be more hands-off during revision rounds? Click here to learn about our Hands-Off Service. What does your proofing look like? We use Album Exposure's Design Studio Platform for proofing. When your proof is initially sent to you for feedback, it will have Align's logo on it. But when it is sent onto your client, it will have your studio's logo on it and will include none of our branding. If you'd like, your clients don't even need to know that you are outsourcing your album design. The URL for the proof will even include your studio's name instead of ours! We number the images on each spread for ease of communication and you and your client can type any changes in text boxes next to the presentation (recommended) or even tag comments to certain spots on the spread. Click here to see an example of what our proofing looks like. What’s the difference between Align's standard workflow and the Hands-Off Service? In our standard workflow, you can choose whether or not to automatically share your client’s comments with your designer, but your designer won't directly communicate back to your client. Your client doesn’t even need to know someone else is involved! You’ll be responsible for notifying your client when each draft of the album is ready and passing along any questions or clarifications your designer might have for them throughout the process. If you choose our Hands-Off Service for an extra $10, your designer will be communicating directly with your client. We will message your client throughout the process by logging into your studio’s AlbumExposure account. Click here to learn more. Excellent question! When you "Accept" the design into your own AE account*, you will be asked whether you want to automatically share your client's comments with Align. If you chose to automatically share (recommended), then both you AND your Align designer will receive email alerts when your client has written comments. Your designer will proceed with making the changes unless you've told us ahead of time to wait for your official go-ahead. Please note that we will never communicate directly with your client unless you explicitly instruct us to do so. If your designer has questions about the comments or needs additional images from you in order to complete your client's requests, she will email you directly. A) Copy & paste the comments (or write them yourself) into the Designer Conversation. At the top of the sidebar next to the album preview, you'll see two tabs that let you toggle back and forth between your Client Conversation and your Designer Conversation. Just copy your client's comment, click over to the Designer Conversation, and paste it there. Then repeat those steps on every spread that contains comments you want to share. When you've finished, hit the "Post All Comments" button and we'll receive a notification with the new requests. Your designer will then proceed with making the changes. B) Change the settings on this album so we can retroactively see your client's comments. Go to this album’s “Settings” page on AlbumExposure and mark “Automatically share all comments with Align”. Important: You MUST then email us to let us know to check the comments (since we won’t receive an email notification until the next set of comments is posted). * If you purchased our Hands-Off service, your designer will be the one "Accepting" the design into your AlbumExposure account and will be choosing the communication option that automatically shares all comments. What if my client requests images that my designer doesn't already have? Option 1: If there are only one or two new images, feel free to email them directly to your designer. Option 3 (For PASS/Cloudspot users): In the AlbumExposure comments, your client can copy and paste the direct PASS link into AE's comment boxes (i.e. Replace image #1 with http://photographersname.pass.us/bridegroom/i-G0YX9168996391). This method can make the comments a little messy and harder to follow, but as long there are only a few new images, the designer can download the images based on those links. The photographer doesn’t even need to be involved! -Go back to AlbumExposure to continue making comments and push "Send All Comments" when you are done reviewing the whole album! -Find the image you referred to in your AlbumExposure comment hit the ENVELOPE icon (share button) on it. -Repeat these steps for every spread you have comments on. -When you’re done with ALL of the comments, push the “Send All Comments” button on AlbumExposure. -Then go back to your full gallery and hit the Share arrow at the top of the page and send your selections to youralbumdesigner@gmail.com. -Find the image you referred to in your AlbumExposure comment hit the Favorite Heart on it. If you already have images saved in the default "My Favorites" list, please create a NEW list for these album photos. Option 7 (For SmugMug users): Tell your client to use the exact image filenames when they write their comments on AlbumExposure. Then if you give your designer access to the full SmugMug gallery and choose the setting that displays the images filenames, your designer can visit the gallery and do a search on the page for the newly requested filenames. Option 8 (For Dropbox users): If the full image collection is uploaded to Dropbox, tell your client to use the exact image filenames when they write their comments on AlbumExposure. Make sure you've shared the full Dropbox collection with info@alignlbumdesign.com so that your designer can visit the folder and use Dropbox's search function to find the newly requested files. Note: We can still only accept a maximum of 300 images for the initial design. This full collection would be a secondary link that would only be used during revision rounds. Option 9: If your client has full resolution copies of their images and you don't mind your client knowing that you're working with Align Album Design, you're welcome to ask your client to gather and send the images directly to us using our uploaders for Hightail or Dropbox. Note: The above strategies are ones that we've experienced, but there are likely other methods that could work too. Feel free to submit any other suggestions. Just keep in mind that the designer can't download or dig through ALL of the images in an entire collection (unless the collection has a search feature) without a culling fee being required. How will my client and I know when my designer has finished my client's requested updates? If you're using our standard workflow, your designer will send you an email letting you know that the proof has been updated. If it's to your liking, simply shoot your client a regular email letting them know that they can view the design at the same link/password as they used before! How do I put my logo on top of the album proof? When the album is in the Design Review stage (between you and Align), it will have the Align logo on top. After you click the "Accept" button, the Align logo will go away. If you'd like to upload your own logo to replace it, log into AlbumExposure, click on Settings on the far right side of the top menu bar, and choose Branding. If you don't upload your own logo, the logo area will be blank. Your client will never see the Align logo. Does the album preview represent the quality level of my final layouts? Nope! The AlbumExposure preview is only a low-res version of your album, which helps speed up loading time. Upon final export, our software will insert your original images into the layouts. So if you are curious about an image's pixelation or quality, just open up the original image on your own computer and view it at the approximate size it will be printed in the album. Do you offer printed albums or just digital layouts? Both! At Align, our core service is album design. For years we have been serving hundreds of photographers by creating album designs to be printed and bound by outside companies. And we still consider this our primary calling! So if you already have an album printing & binding company you love, we'll create your album design to fit their specifications! But we also offer our own in-house line of physical albums called Align Legacy Books for those photographers looking for an all-in-one service. Can you print an album from layouts that I've designed myself? 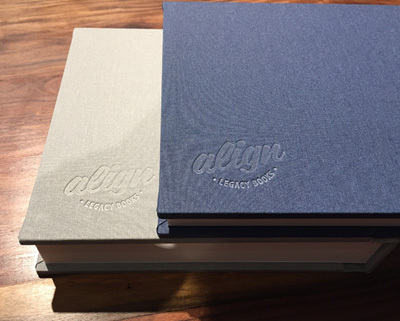 Legacy Books can only be purchased as an add-on to Align’s design service. However if you purchase our design service for the regular $8/spread rate, we may be able to work with your existing design files and/or recreate the design based on mockups you provide. Please email us to discuss your specific scenario. How much do your books cost? Our prices range from $95 to $890 depending on the number of spreads, dimensions, page thickness, cover type, and extra add-ons you choose. To estimate how much your book will cost, check out the pricing chart and calculator at the bottom of our Legacy Books page. Please note that these printing costs are in addition to our album design rate of $8/spread. Do you offer a discounted rate for studio sample albums? Yes! You'll receive 20% off your printed album if you check the "Sample Album 20% Off" box when you're picking out your Legacy Book product type. The album will contain an Align Legacy Books stamp on the back cover. Sample albums are not to be sold to your clients. We offer sample albums so that both you and your client have the opportunity to preview the quality of the album they'll be ordering. Can I use my Align Credit to purchase an Align Legacy Book? No, any Align Credit (pre-purchased or earned) on your account can only be applied to our album design services and not to printed books. 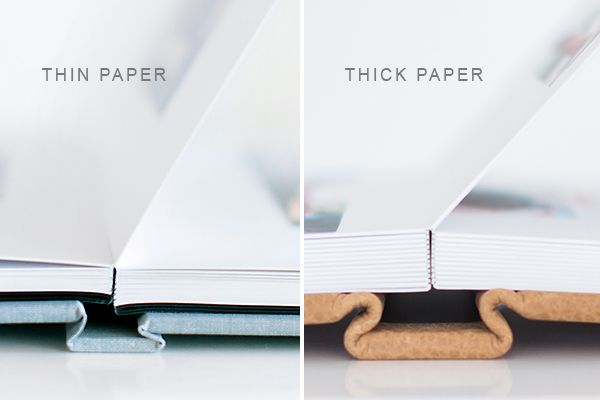 What's the difference between thin and thick pages? Thin pages are approximately 0.8mm and thick pages are approximately 1.8mm. Thin pages do have some bend to them, but are not foldable. Thick pages are not bendable at all. Keep in mind that the thickness of the pages will also impact the thickness and weight of the album as a whole. Thick pages give the book more of a "album" feel, whereas the thin pages will give the book more of a book weight and feel. What are your turnaround times for Align Legacy Book production? After you've finished the design process (click here for our design turnaround times), your Legacy Book will ship within 15 business days of placing your printing order (outside of December holiday season). You’ll receive a FedEx tracking number as soon as your order has shipped. Click here to view our full shipping policy. For a rush fee of $100 per album, we can guarantee the album will ship within 7 business days. -Authorize us to automatically charge your saved credit card (find this setting at the bottom your Edit Profile page). -Or pre-purchase Align Credit on your Account Balance page which will be automatically applied to your balance. Can you ship the album directly to my client? Yep! We can drop ship to your client if you're okay with basic packaging without your studio's branding. Just enter your client's name and address on the Print Confirmation webpage when finalizing your book order. The return address on the mailing label will say Align Legacy Books, but there will be no branding or pricing inside the box. How is your album packaged? All of our albums are packaged in a korrvu insert (Google it) that holds the book tight to the bottom of the box and prevents it from shifting during transit. No bubble wrap or peanuts! Tip: You can reuse the same packaging to send the album onto your client if you pull the insert out and unfold it rather than cutting it. You also have the option of adding a $10 fabric slipcover and/or a $12 white box made of recycled cardboard. These optional materials are not required to protect your album during shipping (the free korrvu insert does that! ), but they will serve as dust-free storage options post-delivery. The return address on the mailing label will say Align Legacy Books, but there will be no branding inside the box. Can you ship your books internationally? At this time our $25 flat shipping rate is only designed for delivery within the domestic United States. If you're a photographer located outside of the USA who's interested in ordering Align Legacy Books, feel free to contact us at info@alignalbumdesign.com with your address and we will look into shipping rates for your country and provide you with a quote. What if the album I receive contains a mistake or is damaged? At the time you place your order, there will be a slideshow of your print-ready files located above your Legacy Book order form that we encourage you to look through carefully. If you find any design issues at that time, please contact us immediately so that your designer can fix it. It is your responsibility to review and approve the design before sending the design to print, so Align cannot be held responsible for design issues found after we’ve received that approval. We guarantee the workmanship of your book. On the off chance your book arrives with a manufacturing defect, contact us within 48 hours of receipt so that we can make it right. Click here to view our full warrany & return policy. We accept Visa, MasterCard, American Express, and Discover credit cards. Our album design service is $8/spread ($4/page) regardless of the design style you choose. Three rounds of revisions are included in this price. Additional revisions are $50/round. A $75 deposit is due at the time of your order. The remaining balance will be billed after the finalization of the album design or at the 3 month mark (whichever comes first). Please note that you will be billed for the highest spread count that occurred during the design process even if some spreads are eliminated before final approval. After your design is approved, if you will be printing your album design through Align Legacy Books, you will be directed to a new webpage where you can select your album options and pay the additional costs for the physical album at that time. What is my total cost? If you already have an album printing & binding company that you love, you'll only be purchasing our $8/spread design service to receive your print-ready digital layouts. We also offer our own in-house line of physical albums for those photographers looking for an all-in-one service. You can calculate the additional cost of the physical album using the calculator at the bottom of our Align Legacy Books page. Your total cost will be $8/spread for design + the cost of physical album from that calculator + $25 flat rate shipping (additional sales tax only applicable if shipping to Indiana). Additional Services: See our pricing page for additional add-on services. Is there a reward for referring a friend to Align? Absolutely! If you have an account with Align, you have a unique referral link -- assigned only to you, that you can use in emails, on your blog, on Facebook, or anywhere you talk about Align online -- that will send others to our site. Any traffic that uses your link will be tracked and you will automatically -- through the wonder that is technology -- receive A $50 CREDIT TOWARD YOUR NEXT ALBUM DESIGN when someone who clicks on your link signs up for an account with Align and places their first order. Where do you find this link, you ask? Login to your Align account and you will find your unique referral link below the right sidebar menu. Copy and paste it from there. Right below it, you can also see your current credit balance. So you can easily track your earnings. Your credit balance will automatically be applied whenever you have a balance due for an album design order. Super-easy! You can start racking up savings today! What is Align Credit? What is it good for? Align Credit is same-as-cash credit stored in your Align account for use toward future designs. It can be earned through promotions, referral rewards, or purchased on your Account Balance page after login or whenever you place your next order. You can even save up to 30% by purchasing Align Credit in bulk! Align Credit will be automatically applied the next time you have a deposit or balance due on an album design. Align Credit never expires but it is not refundable or transferrable. And Align Credit cannot be used towards the purchase of Align Legacy Books. Can I get a bulk discount if I need multiple album designs? Align Credit can be purchased on your Account Balance page after login or whenever you place your next order. Your credit NEVER EXPIRES, so if you know you will have a lot of album orders coming through your studio in the upcoming months and years, purchasing bulk credit is a no-brainer! Please note that Align Credit can be applied to our album design services but cannot be used towards the purchase of Align Legacy Books. Can Align help me with Parent Albums too? Yes we can! There are a few different strategies you can choose from when it comes to creating multiple albums for the same wedding. Use this blog post to pick the method that will be the best fit for your particular project and then share your preferences with us in the Additional Notes section of your order form. My album has a photo wrap cover. Will you design it for me? We can design your photo wrap cover* for an additional fee of $40. If your album company provides a .psd template for the cover, please include it in your zip file of images. If not, please specify the exact specs for the cover in the order form comments section. We cannot be held liable for any issues if you do not provide the proper specs. If you would like your logo on the cover design, please be sure to send that as well. *Please note that we only design photo wrap covers where the image covers the whole cover of the book and oftentimes text is included. If your album is leather with a photo cut-out, you do not need a design service. You will just need to order that through your album company and upload an image. Do you offer image culling so that I can send more than 300 images? For a standard order, we only accept a maximum of 300 images per order to limit download times, file storage space, and the time the designer spends selecting the images to use in the album. However, if you would like to send more than 300 images, we offer a culling service for $.10 per image. If you indicate in the "additional notes" section of your order form that you’d like to use our culling service, we will send you an invoice for the culling fee and then we’ll narrow down your images ourselves. For example, you can pay an extra $35 for us to cull 350 images, $52.40 for 524 images, etc. Do you offer color correction or retouching? No, we do not offer any photo editing besides cropping, tilting, and desaturating (changing color images to b&w). We do however, have an AMAZING partner who offers color correction and editing services -- ShootDotEdit. Definitely check them out! Can you place my album order through my album printing company? If you're looking for a one-stop-shop, check out Align Legacy Books, our in-house album line! After your album design is approved and you've picked out your product options, we'll turn your design into a beautifully printed heirloom album. If your album company is Leather Craftsmen, Madera, HiTech, Folio, or Sander -- You may request to use AlbumExposure's Send-to-Print option on your album design order form. This option allows you to send the layouts to your album company directly through the same website we use for proofing. For all other companies, we will be sending you your print-ready layouts through Hightail for you to download, review once more on your own computer, and then upload to the album company of your choice.